Travel with cats does not have to be a disaster. 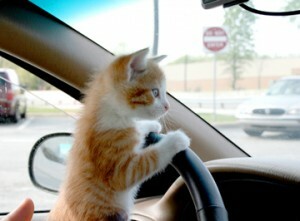 Cats travel by car well if conditioned to it in advance of long trips. The following Travel tips will make travel easier on you and your cat, and will guarantee future invitations for you and your cat to visit again. Make sure your cat will be welcome everywhere you plan to stop. Many hotels and motels allow pets, so do your homework first, and find out the rules, before planning your itinerary. Be sure that you have provided at least one bowl of water for your cat to drink and a litter box. You don’t want to expose your cat to any more risks than necessary, so make sure his shots are current before travelling. It would be also be a good time to ask your veterinarian if she recommends a mild tranquilizer if your cat is particularly nervous about travelling. Be sure to bring a health certificate and proof of vaccination with you — you may need both when travelling through some states. A 500 mile or more trip is not the occasion to test your cat’s travel ability. Accustom her to her carrier by letting her sleep in it, then take her on increasingly longer local drives well in advance of your trip. Make travel a fun occasion, with plenty of rewards, and your cat will soon be a seasoned veteran at travel. Equip your cat with identification. Invest in a good harness with securely attached ID tags. Include your name, address, phone number, as well as contact info for your vet. Leave your itinerary with your veterinarian in case they should receive a call that your cat has been found. Tattooing and micro-chipping are a plus. With his harness and a leash, you can take your cat out to stretch his legs on rest stops. Use an approved cat carrier. Cats should never be allowed to wander freely inside an automobile. Frightened cats invariably head straight for the foot pedals. Kitty will be much more comfortable in her own carrier, with a blanket and toy inside. Try a sturdy metal crate with a solid bottom.